"This seafood gumbo takes some time, but is well worth the investment. Serve over long-grain white rice." Combine the red, white, and black peppers, paprika, thyme, oregano, bay leaf, and salt; set aside. When ready to serve, add shrimp, oysters, and crabmeat. Cover, and wait 5 minutes. Turn off heat, and let stand for 10 minutes. Serve. 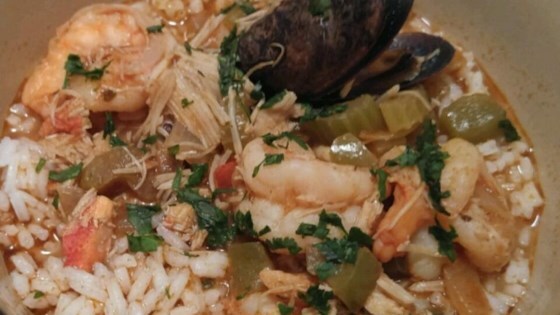 Loaded with crab, oysters, and shrimp, here’s a gumbo for seafood lovers! The stock this recipe uses is great, but this recipe isn't as good. Real gumbo uses a roux as dark as a beer bottle, not tomato sauce.